Grey snappers, yellow goatfish, and French grunts on the reef. 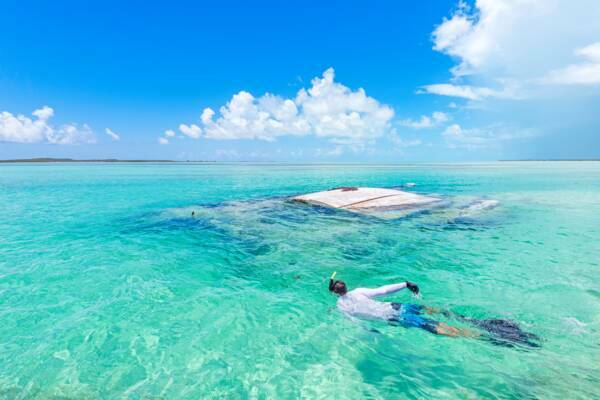 South Caicos is a great location for the adventurous snorkeler. If you’re willing to explore the island’s varied coastlines, you’ll typically be rewarded with unrivalled wildlife sightings. For beginners, it’s best to take a guided boat charter. Snorkelling at a shipwreck in Bell Sound near South Caicos. South Caicos is an amazing destination for the outdoors, and especially for the water sports of fishing, scuba diving, kayaking, and snorkelling. Due to the island’s location on the eastern edge of the Caicos Banks and Caicos Island archipelago, the surrounding waters are a mixing ground for many marine environments, and are consequently a haven for wildlife. The shallows, red mangrove wetlands, sandy channels between the cays, the barrier reef, and the depths of the Turks Islands Passage collectively create a spectacular range of underwater settings. South Caicos tends to be exposed to the consistent eastern trade winds and swell of the open ocean more than many of the other islands in the Turks and Caicos. Because of this, the best snorkelling is typically had at sheltered locations on the lee side of the land. Usually, wind speeds under 10 mph (16 kph) in conjunction with low or no ocean swells are most conducive to pleasant snorkelling. Reef Safe Sunscreen: Please use reef safe sunscreen when in the Turks and Caicos. Common types of sunscreen that contain oxybenzone and octinoxate cause lasting and significant damage to corals and reefs. 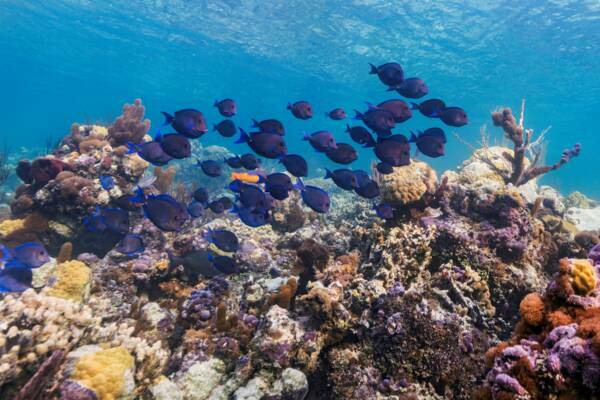 School of blue tangs on the reef. East Bay is one of the more extensive beaches on South Caicos, and interesting snorkelling can be had in the sea grass beds fronting the coast, and along the rocky coasts that fringe the western and eastern sides of the beach. East Bay is easily accessible, yet is a little more susceptible to wind and choppy ocean conditions than some of the other beach snorkelling sites. Starfish, turtles, conch, and small sharks can be seen in the area. Jerry Camp, a water access near Plandon Cay Cut, is a unique snorkelling location on the far northern peninsula of South Caicos. This wetland sound location doesn’t offer much in the way of coral and reefs, yet is an excellent spot for seeing larger sea creatures such as nurse sharks and lemon sharks, southern brown stingrays, eagle rays, turtles, and shallows and channel fish such as barracuda, bonefish, snappers, jacks, and permit. This landing and water access is a natural funnel point for wildlife travelling between the islands, and the area has been utilised by fisherman since before the arrival of Columbus in the New World. The area to the north of Jerry Camp is Plandon Cay Cut, one of the most beautiful vistas in the Turks and Caicos. During abnormally calm weather conditions, the beautiful Highlands Bay coastline of South Caicos offers varied and interesting snorkelling. Directly off the coastal cliffs here are vibrant reefs and coral. The best section of reef is found at the far south eastern point of the beach and South Caicos. The channels near Jerry Camp, Plandon Cay Cut, Sand Bore Cay, and Big Cay. The best way to snorkel at South Caicos is to take a snorkelling charter with a knowledgeable captain. There are countless reefs surrounding the island that are too far out to swim to, yet typically offer vibrant coral and great underwater visibility. Long Cay is an exquisite national park island near Cockburn Harbour on South Caicos. As its name suggests, the island is very long at over 3 miles (5 km), yet is very narrow. 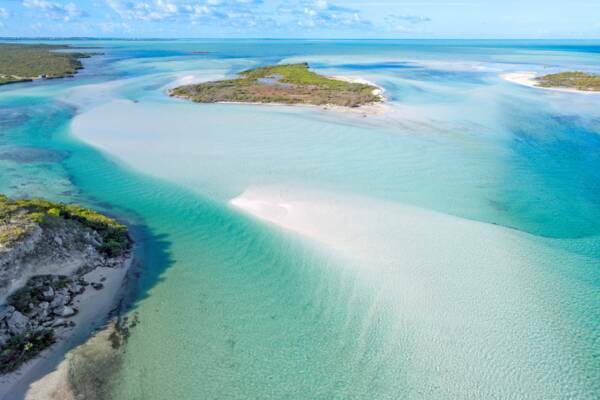 The eastern and western sides of the cay are quite contrasting, with the deep blue of the Turks Island Passage on one side, and the shallow turquoise of the Caicos Banks on the other. The best snorkelling at Long Cay can be found at either the northern or southern ends of the cay. Long Cay offer much more than just snorkelling. Incredible beaches with breath-taking turquoise water line the western side of the cay, and inland, the critically endangered Turks and Caicos Islands Rock Iguana can be seen. The tiny rock island of Dove Cay is located quite close South Caicos and is another great snorkelling site. Due to the cay’s location in the channel between South Caicos and Long Cay, there’s a good chance of spotting larger sea life such as eagle rays, turtles, and sharks. Water visibility here is typically amazing. Be aware of currents. The channels surrounding South Caicos typically have significant water movement due to tide changes. These currents often fade quickly once outside of the natural restrictions, yet it’s important to monitor water movement so as to avoid difficulties. If you’re unsure in the water, snorkel with a knowledgeable guide and wear a personal flotation device. Local tour captains know the best snorkelling locations, and will offer the best chance to see interesting sea creatures. Please use reef safe sun screen. Conventional sun screens that contain oxybenzone or octinoxate have been proven to cause lasting damage to corals and reefs. Many of the South Caicos snorkelling, scuba diving, and water sports locations are inside of either the Admiral Cockburn Land and Sea National Park, or the Bell Sound Nature Reserve. It is illegal to fish or take any natural or historical object from a protected area. Many animals on the reef are capable of inflicting painful stings and bites, including several types of coral, lionfish, scorpionfish, and many smaller creatures. Do not touch anything on the reef.